Title challengers at the beginning of the season, Arsenal and Manchester City are still fighting for a top four place when they face each other this weekend. With Manchester City crashing out of the Champions League in a rather timid fashion, they certainly need to qualify for next season’s competition by finishing in the top four. This doesn’t seem a guarantee anymore as Manchester United are breathing down their necks and with Arsenal scheduled for a visit to the Etihad this weekend, a defeat to would put City’s top four finish very much up for question. The Gunners are winning games and have a three point advantage over Pellegrini’s side so even a loss to the Citizens won’t deter them too much. Manchester United really have the chance to give their city rivals a tough time. Louis van Gaal’s side are four points behind, with a game in hand. They are full of confidence at the moment having qualified for the FA Cup final. Manchester United have won six of their last eight league matches and have improved vastly since the form that put van Gaal’s position in doubt. Finishing in fourth might not be as difficult for the Red Devils. Manchester City absolutely need to win against Arsenal to be in charge of their destiny while United will be praying Arsenal can win against City and confirm their top four place. If the Gunners do that, their participation in the Champions League next season becomes confirmed. If Arsenal don’t win against City, they would be expected to knick a result against the relegated Aston Villa. Nothing is guaranteed and yet, if Manchester United can somehow win their remaining games and have the teams above them slip up, there is still hope. Wenger’s best chance of winning the league, with his direct rivals not performing as well, went early this year. Things have taken s turn for the worse and fans demonstrated their annoyance at the lack of league wins in the game against Norwich last Saturday. The 66-year-old is a towering figure at the club but the Gunners will finish the season empty handed and it is not difficult to see questions being raised about his future. The fans’ anger is also not misplaced as their flaws remain the same this season as they have in the previous barren years. The midfield and strike department lacks the X-factor needed to win trophies and the Frenchman has had years to get that right. Suffering a loss at the Etihad would mean they don’t have a top four place guaranteed for next season. While they’re expected to win at Aston Villa the next week and assure that, it would be embarrassing for the league’s number one title aspirants at the turn of the year to still not be sure about their future until they manage a win over a side that have conceded two more goals than the points accumulated by second placed Tottenham side. Manchester City announced they were getting Pep Guardiola next season and since the announcement, their season hit a bit of a bump. While Pellegrini was extremely professional about the entire incident, perhaps a mid-season announcement wasn’t the best thing for the stability of the squad. City’s impotent performance over the two legs against Real Madrid showed there is plenty of work that needs to be done by the Spaniard next season. After finally reaching the semi-final of the competition, the performance put on by the players wasn’t suggestive of the fact that it was one of the biggest nights in the club’s history. Ninety minutes away from a historical first Champions League final, City put on a performance which wasn’t worthy of a side who had won the league title twice in the last four years. There is no shame in losing to 10 time European Champions but it was the manner of the defeat, the failure of all the “big players” of the club to show up that was particularly startling. Manchester City have suffered from the big-game syndrome in the Premier League as well and have failed to win any of their nine games against the top six this season. A loss against Arsenal on the weekend and Guardiola might start his first season in charge of a club in the Europa League. This tie, in a nutshell, is of imperative importance to each side’s campaign but it’s funny to see these two teams who were title challengers at the beginning of the season still not have a guaranteed top four spot for next season’s campaign when they meet each other on Sunday. 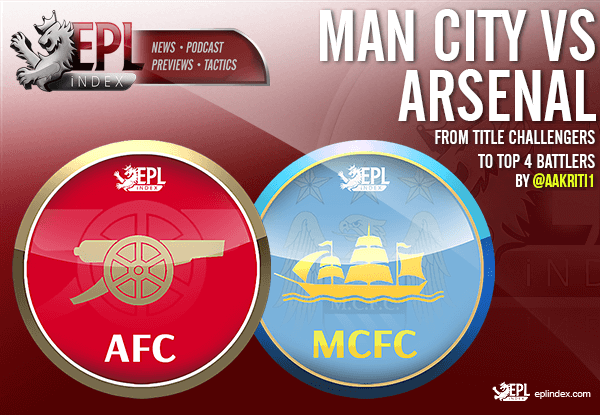 Categories: Arsenal, Arsenal (NN), EPL Index Featured Article, EPL Team Analysis, Manchester City, and Manchester City (NN).' 'Tags: "Manchester United", AFC, Arsenal, Arsenal (NN), Arsenal Stats, english Premier league, EPL Stats, Manchester City, MCFC, and Premier League Stats.